Its look and comfort make Softcurve a prestigious choice for executive and managerial settings. 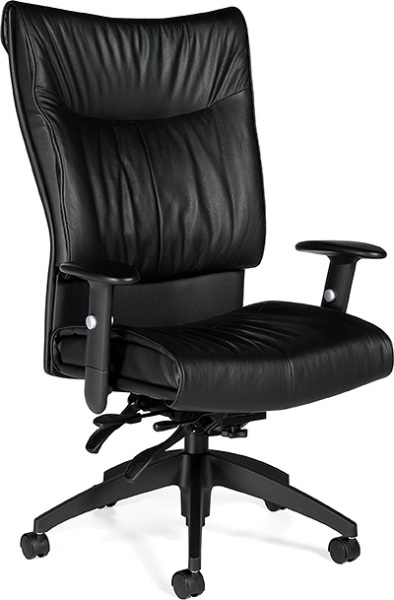 The 4690LM-3 is a high back chair with leather upholstery. In Stock! This item is in stock and ready to ship! All models feature gathered upholstery, built-in lumbar support and layered cushioning. Height adjustable arms with soft touch urethane arm caps. It's look and comfort make Softcurve a prestigious choice for executive, managerial and guest seating applications. Founded in Canada in 1966, The Global Group is one of the largest manufacturers and marketers of quality business furniture in the world. Our facilities include more than 40 just-in-time manufacturing and product assembly plants, plus offices, showrooms and distribution facilities. At Global we're proud of our pledge to maintain a clean environment. We have long established environmental programs throughout our plants and offices to sustain our 'earth friendly' commitment. The people at Global take every opportunity to Reduce, Reuse and Recycle. Global warrants its products to be free from defects in material and workmanship for as long as the original end user owns the product or 25 years in the case of a corporate end user. Some time limits apply to certain parts and components. For detailed conditions, refer to the Global current published Price List. Free Shipping is Drop Ship Delivery to your house, facility building or dock. We can usually provide over the 1st threshold delivery or inside delivery to a particular office suite at an additional cost. Please contact our office via email at sales@furniturewholesalers.com or toll free @ 877-709-9700 to obtain a quotation for this additional service. (We do not mark up our cost). Shipping is usually initiated within 3 to 7 business days of the receipt of a completed order, (one in which the payment has been made or credit approved, any shipping or installation quotations acknowledged and approved, and no outstanding questions or issues are unresolved). Special orders will require an additional amount of time, (usually 3 to 5 weeks). Transit times depend on the relative distances from the various shipping points as well as the carriers used. We provide tracking information which enable you to track your order on-line and obtain an estimated arrival date. Transit time usually runs 3 to 10 business days. Copyright © 2019 FurnitureWholesalers.com. All rights reserved.